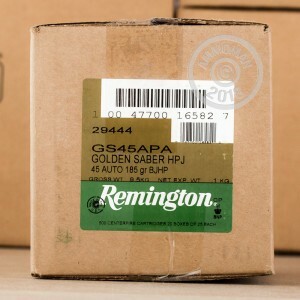 Available in 25-round boxes, Remington's Golden Saber brass-jacketed hollow points offer strong penetration and expansion to quickly and favorably resolve self-defense situations. The light 185 grain bullet in this .45 ACP load delivers high muzzle velocity and a flat trajectory for strong terminal performance. As a standard pressure load, it will work great in any .45 Auto pistol from the compact Springfield XDs to a full-size, all-steel 1911 and everything in between. 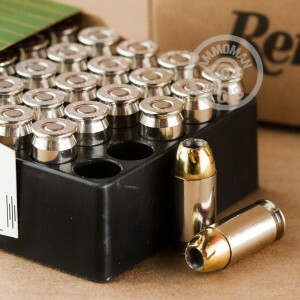 These rounds use non-corrosive Boxer primers and reloadable brass casings, nickel-plated for better corrosion resistance and visibility. 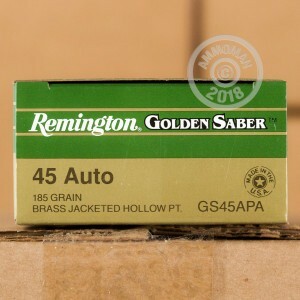 One box of this ammo won't qualify you for AmmoMan.com's free shipping guarantee for orders over $99, so pick up a few or check out the rest of our inventory. All orders over $99 ship free with no additional S&H charges.